I’ll take any excuse to go out and have a picnic. There’s something about eating out in the open air that reminds me of carefree summer days. I’m not too picky when it comes to packing food for a picnic. Sometimes Mike and I will just grab a couple of bags of chips and a blanket and stroll on over to our neighbourhood park and have ourselves a snack outside. Sometimes we’ll get a little more elaborate and actually bring out real cutlery and dishes, but more often that not, we’ll just wing it. That being said, I do like planning out picnic menus. Actually, I just like planning out all kinds of menus. Quinoa salads tend to do well on picnics – they’re portable, they don’t need any assembly and they’re light, yet filling. 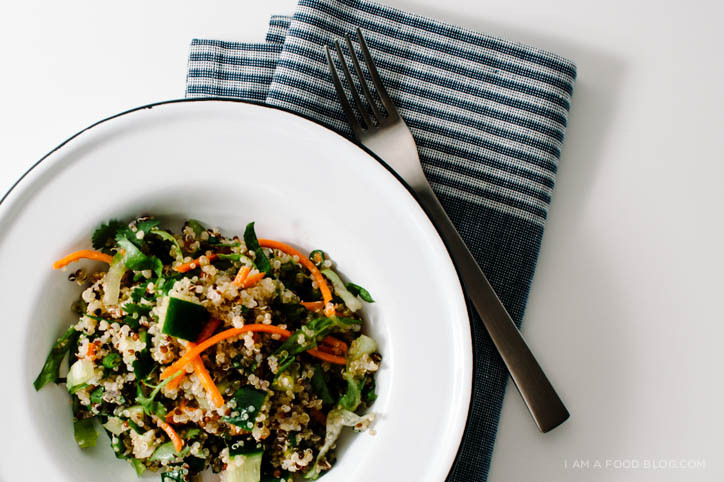 This quinoa salad is super easy: you basically throw all the ingredients together, toss and you’re good to go. 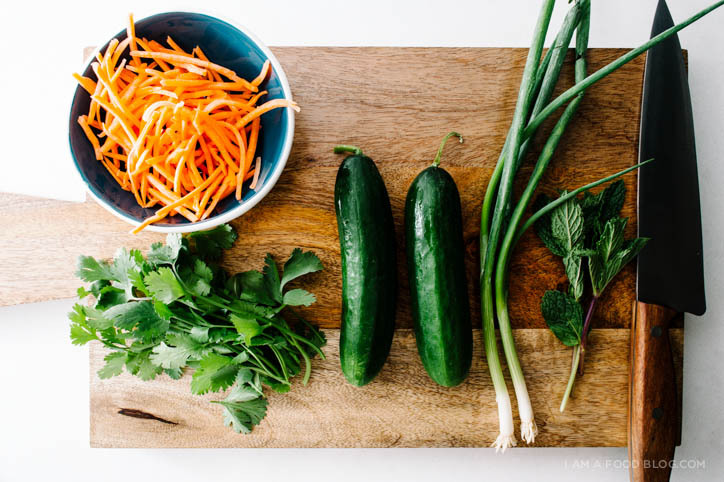 It combines everything I love about Vietnamese food: fresh herbs and big flavours. 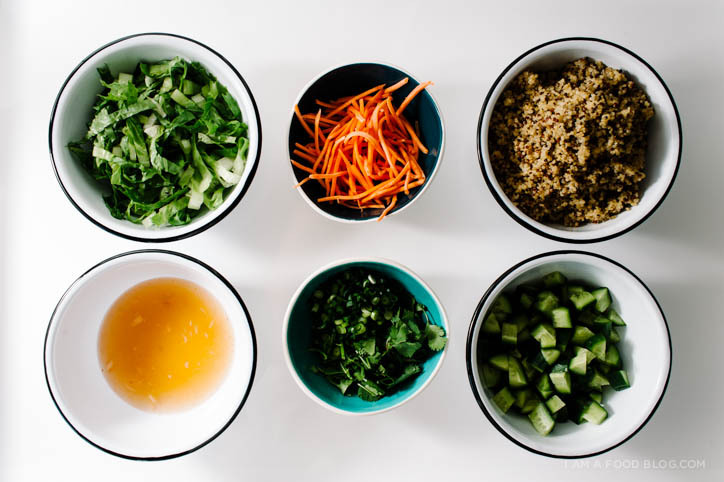 You get the nuttiness of quinoa, the crunch of cucumbers and lettuce and the moreishness of fish sauce. If your looking for a bit more protein you could add some cubes of tofu or shredded chicken, but I like the simplicity of just the vegetables. 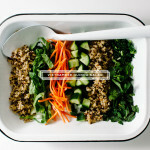 I collaborated with West Elm on this post: check out the recipe and links to the items I used on their blog, Front & Main! 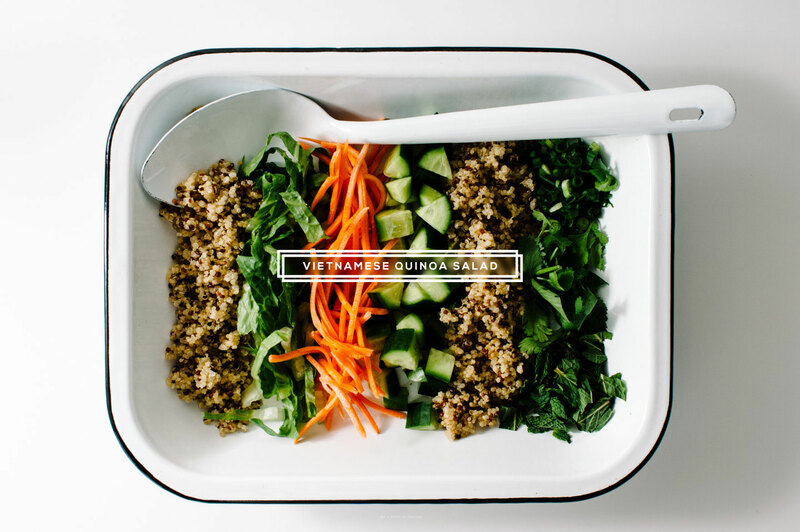 i am fresh, i am portable: i am vietnamese quinoa salad! Lightly toast your rinsed, drained quinoa in a non-stick pot over medium heat for 1-2 minutes. Add the water or vegetable stock, bring to a boil, reduce to low, cover and cook for 15 minutes. Remove the pot from the burner and let sit, covered, for 5 minutes. After 5 minutes, transfer to a large bow, fluff and let cool. While the quinoa is cooking/cooling, make the dressing. Mince the garlic clove as finely as possible. Alternatively, crush it with a motar and pestle. Whisk together the garlic, sugar, lime juice, water and fish sauce until the sugar dissolves. Taste and add sriracha if desired. Set aside in the fridge. 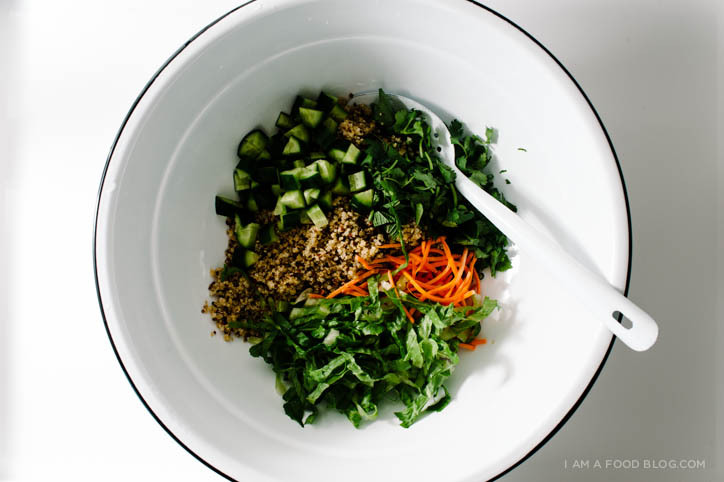 Once the quinoa is cool, add the cucumber, carrot, green onion, cilantro, mint leaves, and shredded lettuce. Add the dressing and toss well. Taste and adjust seasoning with salt and pepper, if needed. Enjoy! NOTE: This recipe can easily be vegan-ized. Just switch out the fish sauce for a tablespoon of soy sauce. 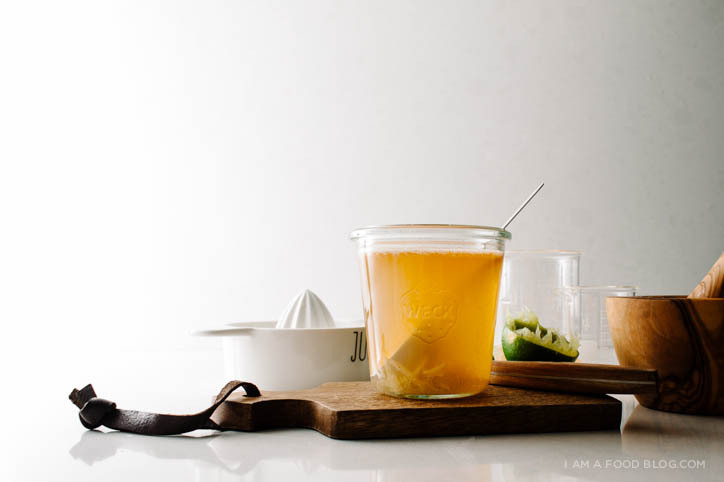 The photo of you on the West Elm blog is sooo cute, lady! You look so happy and also like you’re good at life! Which you are. Yes, this salad — yes! Loving the Viet flavors and everything is so simple. I showed up at my friends’ home last night and they had made A PICNIC. I was in heaven. Our Oregon springs are not usually warm enough to eat outdoors, and I loved the spread they’d set up with sausage and cheese and veggies and sandwiches and watermelon. Timely post! Can’t wait to try! hahahha, I don’t know if I’m good at life! I’m laughing in that photo cause the only clean pan I had was stainless steel and who the heck cooks eggs in a stainless steel pan!??! So easy yet really elegant and tasty looking. Perfect for summer! Picnics are the best. And so are salads like these! So dang simple and so dang good. Love! Maybe with a salad as delicious as this, I can lure my husband out to a picnic with me :) This looks like the perfect balance of light yet filling for the summer months!! Love the Vietnamese flavors too. You need to lure your husband to go on a picnic?! What is he thinking? I will go on a picnic with you Leah!! This sounds like the salad of my DREAMS, Steph. Drooling everywhere right now. Heehee I too dream of salads…no literally, I do. what kind of lettuce have you tried that holds up well for leftovers too? thanks :) excited to try this one! I like to use romaine – the hearts especially hold up well to dressing and have fabulous crunch! This is very nice recipe and picture is fenomenal. It’s probably OK if I substitute quinoa with Bulgur or Amaranth? Oh yes, you can substitute whichever grain is your favourite! I know this is an old post but I just have to say that I tried this recipe a few months ago, as it but with added avocado and topped with seared tofu, and it has been my go-to meal since. I can eat this multiple times a week and have yet to get sick of it…keep these tasty, healthy, and beautiful recipes coming!